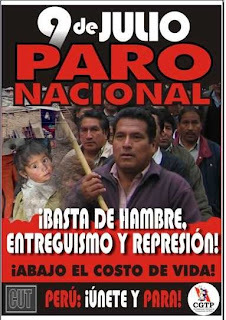 Today there was a one-day work stoppage by unions affiliated under the umbrella of the Confederación General de Trabajadores del Perú (CGTP) to protest the governing APRA party's neoliberal economic policies. The stoppage was, of course, only partial as most businesses are not unionized and the state workers couldn't risk not being at work. Nonetheless, the government launched a massive media campaign to deligitimize the stoppage, with TV and radio spots, banners across streets in the city center, essentially equating striking and violence in numerous statements, and mobilizing 9,000 police officers in Lima alone. Nonetheless, close to 10% (by a government estimate) of the workforce stopped work today, enough to have had an impact across this city. Businesses in the city center were closed, as were some in other parts of town, and traffic of all sorts was appreciably lighter even in Jesús María. There was a large rally in the Plaza Dos de Mayo, in front of the CGTP offices at noon, but by the time Susana and I arrived, close to 2:30, most had dispersed although feeder marches from outlying districts like La Cantuta and Lurigancho were still coming in. Ok, I'm envious. I loved the desert photos. I've seen the dunes up at the Oregon coast, but here, you have an oasis... Very beautiful. Thank you for passing on the email to Liz.